← Vermont Bookstore Adventure Wrap Up in honor of Independent Bookstore Day! I’ve always had a literary soft spot for the lonely old rural man. “Lonely old rural man” may sound like a very specific type, but really it’s no different from manic pixie dream girl or hardboiled detective or any of the dozens of other stock characters in literature and film. They are simply old men living in isolated rural areas. Our of necessity they are strong both physically and mentally and, perhaps most importantly, unshakable in their beliefs. Most of my favorite books have one or two lonely old rural men (LORM) at their center… the Proctor Brothers in Kings of the Earth by Jon Clinch, Moses in Sweetland by Michael Crummy and, although technically he’s younger, Blood in Lost Nation by Jeffrey Lent. An old guy burning down his own farm? That sounded like a Jon Clinch or Jeffrey Lent novel and I wanted more information. My colleague didn’t have much to offer. Something to do with the interstate being built and a family farm in the middle of an off ramp. So I turned to the internet and found an amazing article from 2013 on the Yankee Magazine website. Romaine Tenney grew up on his family’s farm in Ascutney, Vermont. Over the years the rest of the family moved away or died off but Mr. Tenney stayed. In the late 1950s and early 1960s Vermont started building an interstate running north to south. It was generally considered a triumph, a sign of the state’s bright future. 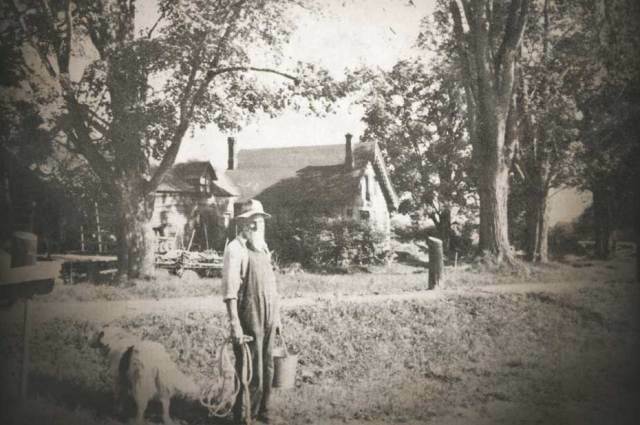 By that time, Mr. Tenney’s farm was rather run down but still functioning thanks to his hard work and love of the land. I’m sure you can see where this is going. Mr. Tenney’s farm lay smack dab in the middle of the soon-to-be interstate Exit 8. The government offered to buy the farm and then claimed eminent domain. On September 11, 1964 the local sheriff and his men removed Mr. Tenney’s belongings. Early the next morning Mr. Tenney released all his animals — horses, cows and dogs — and set the barn on fire. He then barricaded himself in his house and burned it down. They think he shot himself too but they aren’t sure. The story is incredibly similar to the plot of Michael Crummy’s Sweetland, where Moses chooses to stay behind on an island in Newfoundland that everyone else has abandoned. I don’t have an over-attachment to nature, I’m not remotely sentimental about any particular place and it’s only been recently that I’ve come to embrace, and maybe even take a little pride in, my deep Yankee roots. But Mr. Tenney’s story (and the other LORM stories) speaks to me in some inexplicable way. It sparks something in my imagination that I can’t seem to let go. What was he thinking? Why was dying better than leaving a farm he struggled to maintain? What type of person is so devoted to a place that they choose it over their life? And why don’t I feel that passionately about anything? I feel the same envy towards these LORMs that I feel toward the truly religious. I’m baffled by their faith and wish I could believe in something as strongly as they believe in God or land or home. At this point in my life I know I will never experience that level of conviction. I will never willingly choose to die for a cause or to protect my way of life. I would sell out, move and leave it behind. Probably without even much thought. But I still admire people like Mr. Tenney and fictional characters like Moses Sweetland. They seem so steady, so sure what they are doing is right. And isn’t that what we all want in life? Just to know we are doing the right thing?